Protoplanet Vesta, visited by NASA’s Dawn spacecraft from 2011 to 2013, was once thought to be completely dry, incapable of retaining water because of the low temperatures and pressures at its surface. However, a new study shows evidence that Vesta may have had short-lived flows of water-mobilized material on its surface, based on data from Dawn. As NASA’s Dawn spacecraft takes off for its next destination, this mosaic synthesizes some of the best views the spacecraft had of the giant asteroid Vesta. Dawn studied Vesta from July 2011 to September 2012. The towering mountain at the south pole — more than twice the height of Mount Everest — is visible at the bottom of the image. The set of three craters known as the “snowman” can be seen at the top left. The study has broad implications for planetary science. Dawn is currently in the spotlight because it is approaching dwarf planet Ceres, the largest object in the main asteroid belt between Mars and Jupiter. It will be captured into orbit around Ceres on March 6. 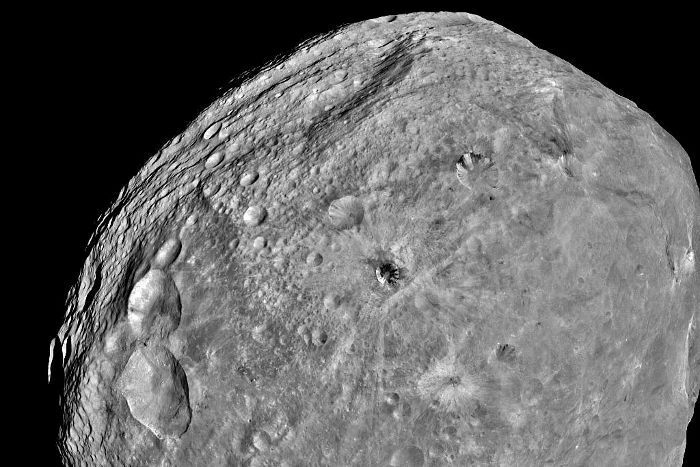 Yet data from Dawn’s exploration of Vesta continue to capture the interest of the scientific community. 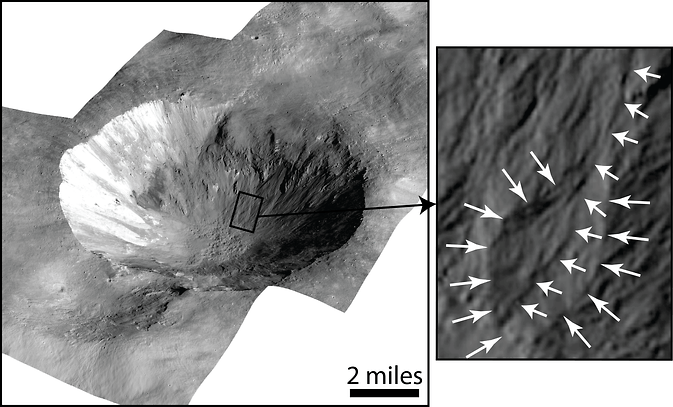 Scully and colleagues, publishing in the journal Earth and Planetary Science Letters, identified a small number of young craters on Vesta with curved gullies and fan-shaped (“lobate”) deposits. “We’re not suggesting that there was a river-like flow of water. We’re suggesting a process similar to debris flows, where a small amount of water mobilizes the sandy and rocky particles into a flow,” Scully said. The curved gullies are significantly different from those formed by the flow of purely dry material, scientists said. 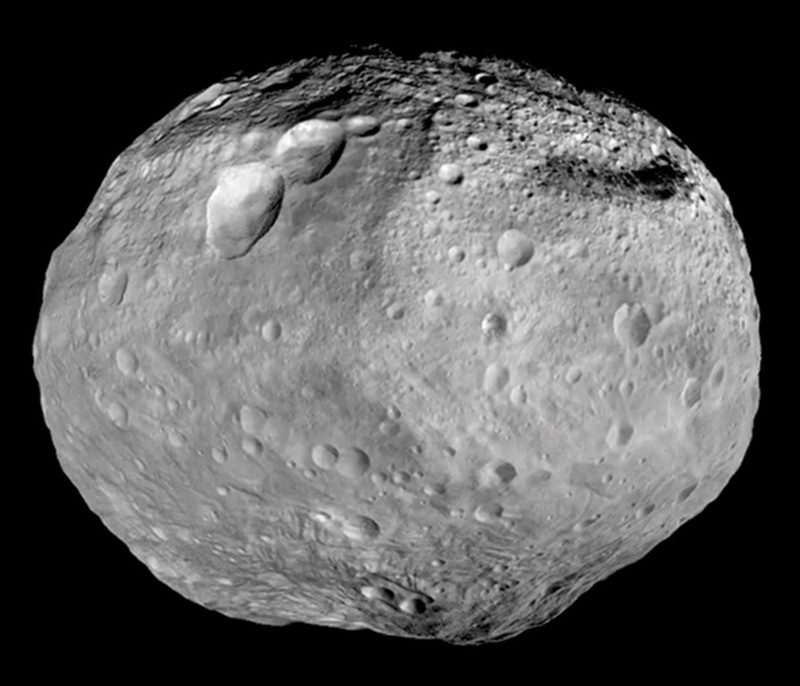 “These features on Vesta share many characteristics with those formed by debris flows on Earth and Mars,” Scully said. The gullies are fairly narrow, on average about 100 feet (30 meters) wide. The average length of the gullies is a little over half a mile (900 meters). Cornelia Crater, with a width of 9 miles (15 kilometers), contains some of the best examples of the curved gullies and fan-shaped deposits. The leading theory to explain the source of the curved gullies is that Vesta has small, localized patches of ice in its subsurface. No one knows the origin of this ice, but one possibility is that ice-rich bodies, such as comets, left part of their ice deep in the subsurface following impact. A later impact would form a crater and heat up some of the ice patches, releasing water onto the walls of the crater. “If present today, the ice would be buried too deeply to be detected by any of Dawn’s instruments,” Scully said. “However, the craters with curved gullies are associated with pitted terrain, which has been independently suggested as evidence for loss of volatile gases from Vesta.” Also, evidence from Dawn’s visible and infrared mapping spectrometer and gamma ray and neutron detector indicates that there is hydrated material within some rocks on Vesta’s surface, suggesting that Vesta is not entirely dry. It appears the water mobilized sandy and rocky particles to flow down the crater walls, carving out the gullies and leaving behind the fan-shaped deposits after evaporation. The craters with curvy gullies appear to be less than a few hundred million years old, which is still young compared to Vesta’s age of 4.6 billion years. Laboratory experiments performed at NASA’s Jet Propulsion Laboratory, Pasadena, California, indicate that there could be enough time for curved gullies to form on Vesta before all of the water evaporated. “The sandy and rocky particles in the flow help to slow the rate of evaporation,” Scully said. The Dawn mission to Vesta and Ceres is managed by JPL, a division of the California Institute of Technology in Pasadena, for NASA’s Science Mission Directorate, Washington. UCLA is responsible for overall Dawn mission science. The two planetary bodies are thought to be different in a few important ways. Ceres may have formed later than Vesta, and with a cooler interior. Current evidence suggests that Vesta only retained a small amount of water because it formed earlier, when radioactive material was more abundant, which would have produced more heat. Ceres, in contrast, has a thick ice mantle and may even have an ocean beneath its icy crust. Ceres, with an average diameter of 590 miles (950 kilometers), is also the largest body in the asteroid belt, the strip of solar system real estate between Mars and Jupiter. By comparison, Vesta has an average diameter of 326 miles (525 kilometers), and is the second most massive body in the belt. The spacecraft uses ion propulsion to traverse space far more efficiently than if it used chemical propulsion. In an ion propulsion engine, an electrical charge is applied to xenon gas, and charged metal grids accelerate the xenon particles out of the thruster. These particles push back on the thruster as they exit, creating a reaction force that propels the spacecraft. Dawn has now completed five years of accumulated thrust time, far more than any other spacecraft. The next couple of months promise continually improving views of Ceres, prior to Dawn’s arrival. By the end of January, the spacecraft’s images and other data will be the best ever taken of the dwarf planet. The Dawn spacecraft has delivered a glimpse of Ceres, the largest body in the main asteroid belt, in a new image taken 740,000 miles (1.2 million kilometers) from the dwarf planet. This is Dawn’s best image yet of Ceres as the spacecraft makes its way toward this unexplored world. “Now, finally, we have a spacecraft on the verge of unveiling this mysterious, alien world. Soon it will reveal myriad secrets Ceres has held since the dawn of the solar system,” said Marc Rayman, of NASA’s Jet Propulsion Laboratory in Pasadena, California, chief engineer and mission director of the Dawn mission. Dawn will be captured into Ceres’ orbit in March, marking the first visit to a dwarf planet by a spacecraft. To date, the best images of Ceres come from the Hubble Space Telescope. In early 2015, however, Dawn will begin delivering images at much higher resolution. 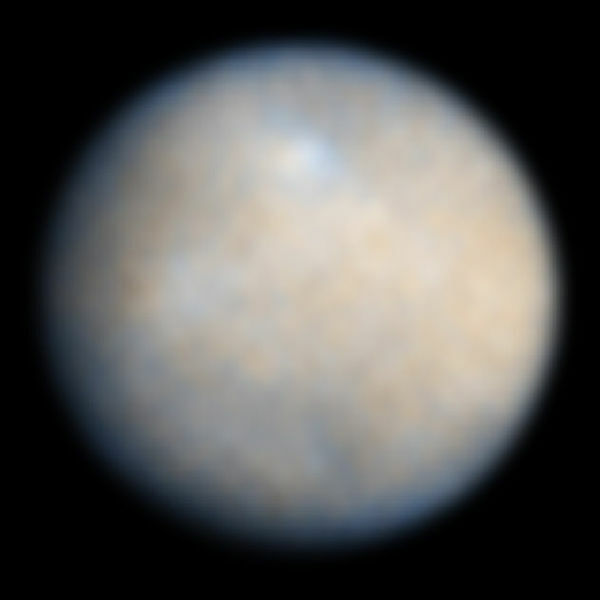 Composite greyscale image of Vesta taken by the Dawn spacecraft. The Dawn mission to Vesta and Ceres is managed by NASA’s Jet Propulsion Laboratory, a division of the California Institute of Technology in Pasadena, for NASA’s Science Mission Directorate, Washington D.C. UCLA is responsible for overall Dawn mission science. The Dawn framing cameras were developed and built under the leadership of the Max Planck Institute for Solar System Research, Gottingen, Germany, with significant contributions by German Aerospace Center (DLR), Institute of Planetary Research, Berlin, and in coordination with the Institute of Computer and Communication Network Engineering, Braunschweig. The Framing Camera project is funded by the Max Planck Society, DLR, and NASA/JPL. Images from NASA’s Dawn Mission have been used to create a series of high-resolution geological maps of the large asteroid Vesta, revealing the variety of surface features in unprecedented detail. These maps are included with a series of 11 scientific papers published this week in a special issue of the journal Icarus. 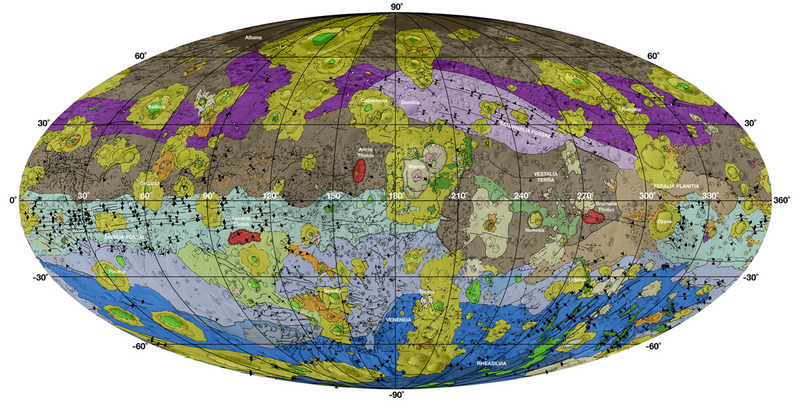 “The geologic mapping campaign at Vesta took about two-and-a-half years to complete, and the resulting maps enabled us to recognize a geologic timescale of Vesta for comparison to other planets,” said Williams. Scientists discovered through these maps that impacts from several large meteorites have shaped Vesta’s history. Asteroids like Vesta are remnants of the formation of the solar system, giving scientists a peek at its history. Asteroids could also harbor molecules that are the building blocks of life and reveal clues about the origins of life on Earth. Vesta’s geologic timescale is determined by the sequence of large impact events, primarily by the Veneneia and Rheasilvia impacts in Vesta’s early history and the Marcia impact in its late history. The oldest crust on Vesta pre-dates the Veneneia impact.The relative timescale is supplemented by model-based absolute ages from two different approaches that apply crater statistics to date the surface. The objective of NASA’s Dawn mission is to characterize the two most massive objects in the main asteroid belt between Mars and Jupiter – Vesta and the dwarf planet Ceres. The spacecraft launched in 2007. Vesta, orbited by the Dawn spacecraft between July 2011 and September 2012, was thought to be the source of a unique set of basaltic meteorites (called HEDs, for howardite-eucrite-diogenite), and Dawn confirmed the Vesta-HED connection. JPL manages the Dawn mission for NASA’s Science Mission Directorate in Washington. Dawn is a project of the directorate’s Discovery Program, managed by NASA’s Marshall Space Flight Center in Huntsville, Alabama. The University of California at Los Angeles (UCLA) is responsible for overall Dawn mission science. Orbital Sciences Corp. in Dulles, Virginia, designed and built the spacecraft. The German Aerospace Center, the Max Planck Institute for Solar System Research, the Italian Space Agency and the Italian National Astrophysical Institute are international partners on the mission team. It’s going to be a ball when NASA’s Dawn spacecraft finally arrives at the dwarf planet Ceres, and mission managers have now inked in the schedule on Dawn’s dance card. Dawn has been cruising toward Ceres, the largest object in the main asteroid belt between Mars and Jupiter, since September 2012. That’s when it departed from its first dance partner, Vesta. Ceres presents an icy — possibly watery — counterpoint to the dry Vesta, where Dawn spent almost 14 months. Vesta and Ceres are two of the largest surviving protoplanets — bodies that almost became planets — and will give scientists clues about the planet-forming conditions at the dawn of our solar system. When Dawn enters orbit around Ceres, it will be the first spacecraft to see a dwarf planet up-close and the first spacecraft to orbit two solar system destinations beyond Earth. As a prelude, the team will begin approach operations in late January 2015. The next month, Ceres will be big enough in Dawn’s view to be imaged and used for navigation purposes. Dawn will arrive at Ceres — or, more accurately, it will be captured by Ceres’ gravity — in late March or the beginning of April 2015. Dawn will make its first full characterization of Ceres later in April, at an altitude of about 8,400 miles (13,500 kilometers) above the icy surface. Then, it will spiral down to an altitude of about 2,750 miles (4,430 kilometers), and obtain more science data in its survey science orbit. This phase will last for 22 days, and is designed to obtain a global view of Ceres with Dawn’s framing camera, and global maps with the visible and infrared mapping spectrometer (VIR). Dawn will then continue to spiral its way down to an altitude of about 920 miles (1,480 kilometers), and in August 2015 will begin a two-month phase known as the high-altitude mapping orbit. During this phase, the spacecraft will continue to acquire near-global maps with the VIR and framing camera at higher resolution than in the survey phase. The spacecraft will also image in “stereo” to resolve the surface in 3-D.
Then, after spiraling down for two months, Dawn will begin its closest orbit around Ceres in late November, at a distance of about 233 miles (375 kilometers). 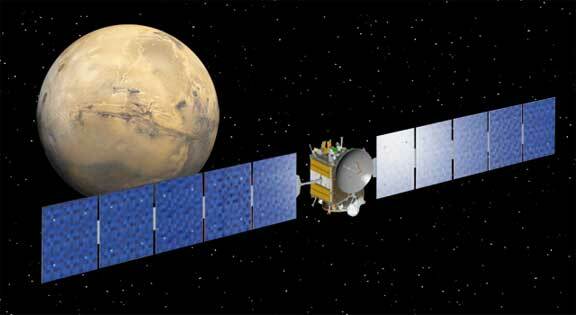 The dance at low-altitude mapping orbit will be a long waltz — three months — and is specifically designed to acquire data with Dawn’s gamma ray and neutron detector (GRaND) and gravity investigation. GRaND will reveal the signatures of the elements on and near the surface. The gravity experiment will measure the tug of the dwarf planet, as monitored by changes in the high-precision radio link to NASA’s Deep Space Network on Earth. At this low-altitude mapping orbit, Dawn will begin using a method of pointing control that engineers have dubbed “hybrid” mode because it utilizes a combination of reaction wheels and thrusters to point the spacecraft. Up until this final mission phase, Dawn will have used just the small thruster jets, which use a fuel called hydrazine, to control its orientation and pointing. While it is possible to explore Ceres completely using only these jets, mission managers want to conserve precious fuel. At this lowest orbit, using two of the reaction wheels to help with pointing will provide the biggest hydrazine savings. So Dawn will be spinning up two of the gyroscope-like devices to aid the thrusters. In 2011, the Dawn team prepared the capability to operate in a hybrid mode, but it wasn’t needed during the Vesta mission. It was only when a second (of four) reaction wheels developed excessive friction while Dawn was leaving Vesta in 2012 that mission managers decided to use the hybrid mode at Ceres. To prove the technique works, Dawn engineers completed a 27-hour in-flight test of the hybrid mode, ending on Nov. 13. It operated just as expected. “The successful test of this new way to control our orientation gives us great confidence that we’ll have a steady hand at Ceres, which will enable us to get really close to a world that we only know now as a fuzzy dot amidst the stars,” said Marc Rayman, Dawn’s chief engineer and mission director, based at JPL. Of course, mission planners have built some extra days into the schedule to account for the small uncertainty in the efficiency of the solar arrays at such a large distance from the sun, where sunlight will be very faint. The solar arrays provide power to the ion propulsion system, in addition to operating power for the spacecraft and instruments. Mission planners also account for potential variations in the gravity field of Ceres, which will not be known precisely until Dawn measures them. Dawn is a space probe launched by NASA on September 27, 2007, to study the two most massive objects of the asteroid belt – the protoplanet Vesta and the dwarf planet Ceres. Currently en route to Ceres and scheduled and expected to arrive in February 2015, Dawn was the first spacecraft to visit Vesta, entering orbit on July 16, 2011. Should its mission succeed, it will also be the first spacecraft to visit Ceres and to orbit two separate extraterrestrial bodies. Dawn’s mission is managed by JPL for NASA’s Science Mission Directorate in Washington. Dawn is a project of the directorate’s Discovery Program, managed by NASA’s Marshall Space Flight Center in Huntsville, Ala. UCLA is responsible for overall Dawn mission science. Orbital Sciences Corp. in Dulles, Va., designed and built the spacecraft. The German Aerospace Center, the Max Planck Institute for Solar System Research, the Italian Space Agency and the Italian National Astrophysical Institute are international partners on the mission team. The California Institute of Technology in Pasadena manages JPL for NASA. “As NASA’s Dawn spacecraft makes its journey to its second target, the dwarf planet Ceres, Marc Rayman, Dawn’s chief engineer, shares a monthly update on the mission’s progress.